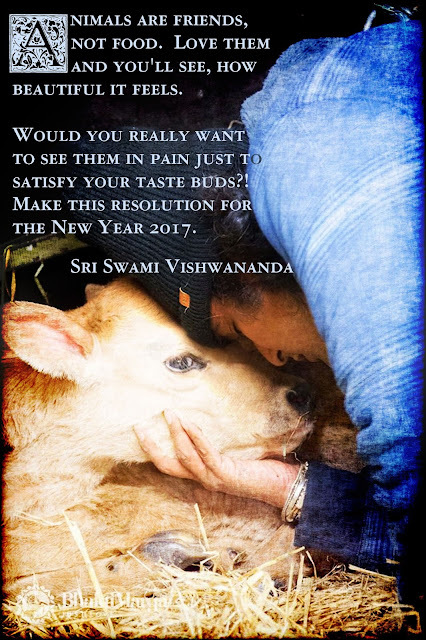 SWAMIS NEW YEAR BLESSING 2017! Sri Swami Vishwananda - How can we help an old person to prepare for dying? How can we help an old person to prepare for dying, if that person doesn't believe in any religion or believe in something absolute? Sri Swami Vishwananda clarifies how to support people who are about to leave this life. For more Information please visit www.bhaktimarga.org! I would like to share something with you from a satsang what Swami Vishwananda answered when asked why Atma Kriya awakens so much negativity. The Divine Mother is somehow an abstract image for me. How can we make contact with the Divine Mother? Which practice, rituals or ceremonies help for that? SV: If you want to make contact you have to know that the mother is always close to Her children. Bearing in mind that the mother is close, if you have faith, you call upon Her, she will be with you. If you want to please Her with ritual, there are many. But they are complicated. You need to learn properly. But if you can love Divine Mother like a child loves the mother it’s the most simple way. And she will be with you. You see, if you want to find God, you will only find Him in the most simple things. When you pray, when you sing, the Divine is next to you. It´s not in vain. When you pray to the Divine Mother She will come and when She wants you to have a vision of Her you will have a vision. But you have to prepare yourself. You have to prepare your mind. You have to control it. You need to have a clear aim, this gives it a certain direction. So if you concentrate you become more and more strong. Why of all the paths did you choose the Hindu Vaishnava and the Russian Orthodox lineage? SV: The mysticism in Vaishnava and in Orthodox is similar. I am born Hindu, like everybody else is born Hindu. In Hinduism you do not have to do special rituals when you are born whereas in all other religions you have to do a ritual to become that religion. How can we develop humility that helps to awaken love within us? SV: The cosmic love awake when you forget about yourself. So the Divine can take full possession of you. As long as you trust that you can do it by yourself, its good, you have to make your effort, but bear in mind, its Him who does it. Remember that God is everything. Then you can find Him everywhere. Beloved Guruji, how to practically understand words from the Bible like “if someone beats you on one cheek, give him the other one, too”? SV: Your duty is to love, not matter if the other person loves you or not. But if you give love, it does not matter if they slap you, gossip about you. You just love them, don´t be disturbed about what others give to you, but be concerned what you give to others. That is what this parable means. Dear Guruji, does bliss, ananda, nourish demons and gods? 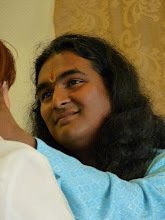 SV: When you are in ananda, you rise above qualities. So, ananda is beyond good and non-good qualities. In the state of bliss neither good nor bad exists. Neither good nor non-good is nourished. You are transcending the good and the not-good qualities. Bliss is not a quality, it’s a state. Question continues: Does immortality mean liberation? 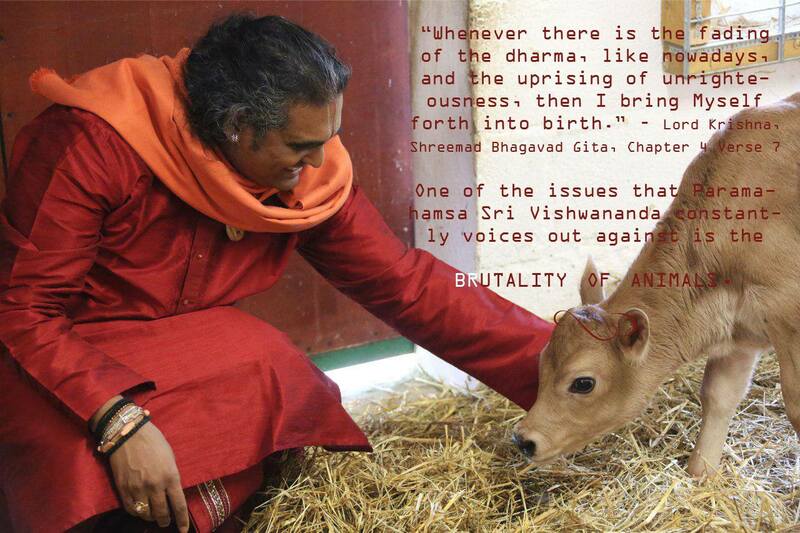 SV: No, the Devas are immortal but not liberated since they are bound by their dharma. Whereas when humans rise they realise the immortality of the soul and that makes one free. You are not bound by limitations of things, you are free in the Divine. The immortal ones sit and watch whereas the liberated ones they attain the Lord. Dear Swamiji, I would like to ask you about the Jehova witnesses. They believe that only Jehova is the best and everything else is taken from Satan. Please, tell me what is the truth. SV: God laughs about this. He says: I am one with many form because each quality of me is a form. He is the same God with many qualities. If God would be limited He would not be god. God is in each heart? Which God is it? Hindu, Muslim, Christian…. The God of love. When all dissolves only love stays. When ignorance disappears from the mind, God reveals itself. It does not matter what people believe, as long as they believe but don’t criticise others. That will make you a better human being. Above religion you are a human, that’s very important. You have to have the respect of the humanity, towards the people. One has to open the windows of the mind than it becomes clear. If your parents don´t respect you it does not matter, you respect them, that is important. Why did God create Maya? SV: he created Maya so that He can enjoy His creation in everything. If He did not know how could He enjoy His creation? Swamiji, can you please explain the experience of Déjà vu? SV: It´s not a dreaming state. When you sleep your consciousness travels and it photos images. But when the fact happens when you are in normal life, you remember that you have seen it. The mind is like a recorder, everything gets recorded in the mind. Even an imprint you left in a place you can recall it in another life. The mind is the storage of the thoughts and it will make it happen. For that you have to be watchful of every thought in the mind. That’s déjà vu, an imprint. Consciousness is not limited, there is not wall to stop it. Is it possible that the golden age does not take place on this planet earth, but in a different world? SV: No, it will take place here. A yogi rotates in sat yug, they perceive the Divine everywhere. A material person will be in kali yuga cause they are so afraid of destruction. You have to make golden age happen now for you. Cause if you wait for golden age even your bones will not be here. How to develop complete obedience and 100%surrender to the Satguru? SV: To reach that state you have to remove your own will. People always talk about surrender, it´s just talk. If you want to surrender, just try it. You teach us Indian mantras, bhajans, rituals, aspects of God. I noticed that a lot of people around you wear Indian cloths. Do we – in western countries – have to live an ´Indian life` to realize God? What is your advice? SV: It is a certain respect towards the aim. It´s not about Indian cloths, it´s about being well dressed. But it will help on the way. There is a dress code for every occasion: church, beach. How can we help an old person to prepare for dying (she is talking about), if that person does not follow any religion but believes in something absolute? SV: You have to tell them: yes you will die. If you don´t accept that you die you will suffer even afterwards. But if you accept it it can open doors. You have to make the person not afraid of dying by talking of the immortality of the soul. Who will end the weapon race between nations? SV: He will end it when there is understanding. Why “Bhaja Nitai Gauranga Radhe Shyam Japa Hare Krishna Hare Ram”? You see “Bhaja Nitai Gaur” – “Bhaja” here stands for seva. It stands for the service one is rendering. It´s not a physical service, but it’s a service to the world through vibration. The aim of human life is to attain pure love, so that you can truly say that you have loved God. Like I explained in the satsang: there are stages to reach sacred love - prem. In this yuga they say always “chanting the Divine Name one achieves that level”. So why Gauranga? Gauranga is a combination of Radha/Krishna, so that’s why we are singing “Bhaja Nitai Gaur” – service to Nitai and Gauranga, which is service to RadhaKrishna. At the same time “Japa Hare Krishna Hare Ram” – at the same time you are chanting the mahamantra also. So how you will reach the love is by chanting and through the grace of Prabhu Nityananda - and Mahaprabhu can give Himself. Because if Nityananda Prabhu says something Mahaprabhu can´t refuse. It’s the same if Radha says something to Krishna, Krishna can´t refuse. That’s why it is said that Radharani is more wonderful than Krishna Himself. There is three kind of Love. When we talk about love, you say “I love you”, always – have you ever written a sms to Krishna, to God, to say “God, I love you and I miss you so much”? No, you never! People: Yes! (lots of laughter) But to all the people you say “I love you, I love you, I love you”, you know. Imagine how much love that He has – for you, and yet, you forget about it. You are mostly concerned about human love, relationship all this, which will last only for some time and finish and then you jump again on another thing. Misery, misery, misery, misery, misery, misery – always misery! When your soul aim is to attain – just love, through service to Him. By chanting “Bhaja Nitai Gauranga Radha Shyam Japa hare Krishna hare Ram”, these 15 minutes that you give of your time is a great contribution. Because everything is vibration, you know, everything vibrates. This time, when you concentrate and when you are chanting – He is here. And that´s what the mantra awakes. The knowing, that He is the Lord that governs everything. He is the Lord that governs your heart and He is the Lord of your heart and nobody else. In the Gita, it says “All the names that you chant are mine, all the forms are just inside of me, not out of me. Nothing can exist out of me. Whatever you see…”. You can say “yes, God is there, outside”, but the whole universe is inside of Him. How can you be out of Him? Without Him you would not be here. You can´t exist without Him! So that is what you have to realize: Even if in His cosmic form, He is deep inside everybody, He is in everything, but yet we are all part of His cosmic body. What you see outside is the yog-maya, which catches everybody, which veils everybody through ignorance. But it is also His maya. His maya also catches Him. And His maya is Radharani – He can´t escape Her. He can´t escape because Radharani is completely fully in love. “Bhaja Nitai Gaur”, oh Lord Nitai! How you surrender to Gauranga, how you surrender to love incarnate? Through the service I am giving. Make also this love awake inside of us, make us also part of this drama, make us part of this contribution that we can give to this world. That´s what “Bhaja Nitai Gaur” stands for, you know. In the Narada Puran, Krishna Himself said to Narad Muni “one can give big lectures, one can talk a lot, one can read a lot, but if they don´t have love inside their heart, it´s nothing.” So, it´s that what is important. To learn to love God, you know. Not superficial, but real. So, that’s in short that what the mantra stands for.